Saft has received its third contract from a major California utility. 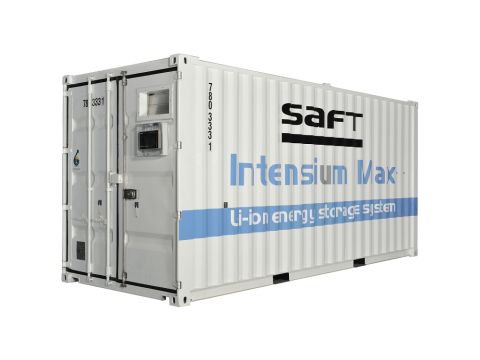 Since the first utility-scale storage system was commissioned at the end of 2012, Saft received two additional contracts bringing the total to a combined energy storage system (ESS) capacity of 7.5 MWh, deployed in 12 containers. The lithium-ion (Li-ion) energy storage systems will be used to mitigate power fluctuations inherent with solar-generated electricity. The first ESS supplied by Saft to the California utility, partially funded by the Department of Energy, ultimately participated in one of the first times in the nation’s history that a microgrid was used to power a large portion of a community during an emergency situation. Commissioned in late 2012, the contract included three battery containers and one power electronics container, rated at 500kW/1500kWh and installed at a remote desert community microgrid. The community is served by a single transmission line that is subject to disruptions due to weather fluctuations and the prevalence of wildfires. Saft’s ESS solution demonstrated its operational value in the fall of 2013 when intense thunderstorms cut power to the community. Saft recently delivered and installed the second ESS for microgrid application at the same desert community substation. This ESS, which is housed in four containers, is larger in capacity and rated at 1MW/3MWh. Also rated at 1MW/3MWh, Saft’s third ESS delivery will be used at an urban educational facility. Saft’s ESS will moderate the effects of shade on the rooftop solar power system by shifting energy and buffering during intermittent sunlight. This third contract highlights the positive field performance of Saft’s energy storage systems and positions Saft for future business in the region. Under the California Public Utilities Commission’s implementation of AB 2514, the California investor-owned utilities are required to procure 1.3 GW of cost-effective ESS by 2020, and Saft is well positioned to contribute to the planned 32% of distribution storage under the program.